“뜻을 한데 모아 마음이 흩어지지 않”게 하라는 가르침인 듯합니다. 학업이든 직업이든. 그 방면의 달인이 되려면 뜻을 세워 한 곳만 바라보고 끝없이 정진하는 수밖에 없다는 것입니다. 다 아는 것입니다만 그것을 실천하는 일이 여간 어려운 것이 아닙니다. 다른 길이 없는지도 궁금하고 종내 성공할 수 있을지도 확신이 서지 않아 우왕좌왕합니다. 제가 경험한 바에 따르면 달인이 되는 길의 가장 큰 장애물은 조급증입니다. 천재는 1퍼센트의 영감과 99퍼센트의 노력이다. 꾸준함’을 잃게 되면 사람들은 거짓으로 포장된 핑계만 늘어놓을 뿐이다. 핑계 없는 무덤은 없다.수적천석(水滴穿石)이란 말이 있다. 작은 물방울이라도 끊임없이 떨어지면 결국 돌에 구멍을 뚫는다는 것. 작은 노력이라도 꾸준히 지속한다면 큰일을 이룰 수 있다는 것이다. 꾸준함을 이길만한 무기는 없다. "'꾸준함'이 언젠가는 '타고남'을 마주할 수 있을 거다. 현실에 쩔쩔맬지언정 꿈꾸는 것을 포기 말자"
Teenage figure skater Cha Jun-hwan is emerging as a rising star who can repeat the glory that Olympic gold medalist Kim Yu-na has achieved in the sport. The teenager set a new world record of 239.47 points to win the men's singles title at the International Skating Union Junior Grand Prix in Yokohama last month and with another win at an event in Dresden, Germany, earlier this month, he has secured a berth at the ISU Junior Grand Prix Final in Marseille, France in December. The Chosun Ilbo met with Cha, who worked as a child model when he was little, at the Taeneung Training Center in Seoul on Tuesday. Cha Jun-hwan poses at the Taeneung Training Center in Seoul on Tuesday. When asked about his increasing popularity, he said, "I think now I get a bigger applause [after performances] than a year ago. Also, I got a lot of gifts from my fans. The most impressive one was a doll of myself in the same stage outfit as me." "I'm not good enough to be compared to [Kim Yu-na]. That makes me feel ashamed. There are still many things to learn," he added humbly. Cha has grown exponentially as an athlete since he started training under Brian Orser, the former coach of Kim, in March last year. Since then, he has trained in Toronto, Canada, where world-class figure skaters like Japan's Yuzuru Hanyu and Javier Fernández of Spain also train. 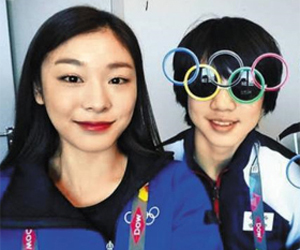 Cha Jun-hwan (right) poses with Kim Yu-na at the Lillehammer 2016 Youth Olympic Games in February in this picture from the Instagram account of the International Olympic Committee. "Just being in the same space as such great skaters motivates me," he said. "I have little difficulty communicating with the coach and other skaters in English as I have steadily learned it since childhood." Kim took up skating as a hobby when he was a second grader in elementary school. He was a slow learner, but he was positive and continued to practice and those efforts have finally paid off. "I think I knew from a young age that effort is more important than talent," he said. About his future goals, he stressed that he does not fixate on winning an Olympic medal or renewing a record. "If I set a big goal, I tend to feel burdened and make mistakes. Rather than rankings and scores, I try to focus on upcoming events and what I'm practicing at the moment."